I’ve expanded into video this year. As you’ve probably noticed, it’s a very popular form of content marketing. All I really need is a good storyline and my imagination. No need to scout for shooting locations– I can create my own settings. My videos look different, and that makes them stand out. I think this video succeeds because of the brand’s surprise appearance at the end. 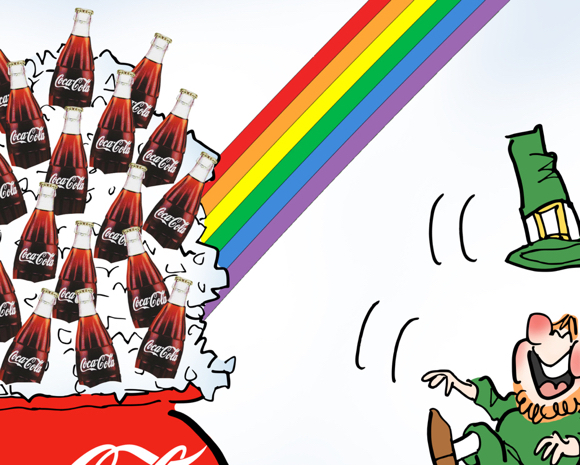 All that green, and then, boom!– the famous Coca-Cola red. The ending also works because the surprise is not immediate. The camera “pulls back,” so to speak, and you finally realize exactly what’s at the end of the rainbow. Is video an important part of your content marketing strategy? 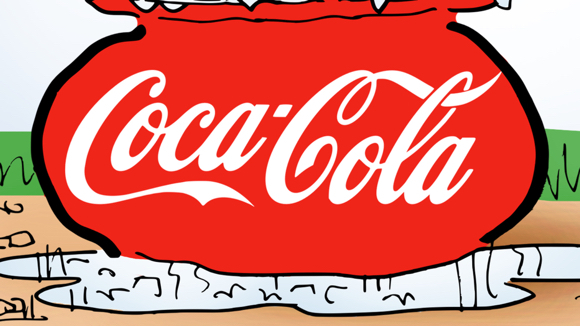 Do you try to feature a mix of both branded and non-branded content? Did the ending here surprise you? Have you ever seen a sheep driving a taxi?? ← Question: Why Is A Block Of Stone Like A Block Of Text? Hey there Mark. I’ve never been involved in advertising, but I do have a couple of thoughts. First is this: does content marketing apply to Japanese advertising? I think it does, and apparently, Japanese advertising agencies are masterful at this art. I’ve heard it described as “setting a mood, or feeling”– and some American audiences seem to scratch their heads on what exactly the commercial is supposed to be about, because the content seems to have very little to do with the product. Second: my daughter is exploring animation, and I think she’s getting pretty good. Hi, Jak! Good to see you, and please excuse this tardy reply. Until I read your comment, I had never given a moment’s thought to Japanese advertising. I’ve just spent some time reading about it: absolutely fascinating, but not particularly easy to summarize. Apparently comedians are now an integral part of Japanese culture– which was news to me. This comedic influence is reflected in some truly off-the-wall television ads; you can see some good examples in this post. And for pure wackiness, I’d have to recommend this Toyota ad— definitely not the sorta “car ad” we’re used to seeing during football game commercials here in the States!! Other factors: space is at a premium in Japan, and advertising is everywhere– it’s hard for an ad to stand out. Japanese education tends to be skills-based with less emphasis on creative thinking, so western-style conceptual advertising doesn’t connect as well in Japan. Anyway, enough of that. Glad to hear your daughter is doing some animation, it seems to be a very promising field at the moment. Always good to see you, Jak– thanks, as always, for your kind support! Yes, it seems like advertising, although somewhat influenced by the West, is very reflective of the collectivist East Asian culture! 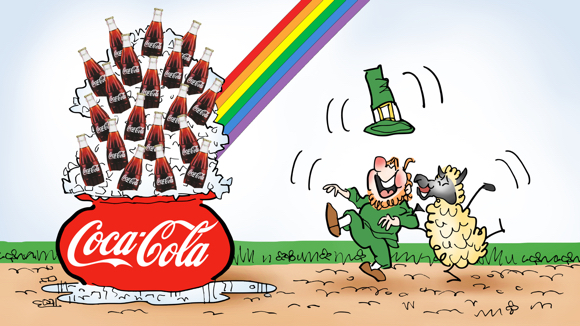 well funnyman, you made an Italian suffer through something very unpasta-like, but I dare say (shh, don’t tell my folks Vito and Carmella) I thoroughly enjoyed – in fact if there is a bubbly beverage at the end of the rainbow – I’d wouldn’t mind drinking it in Ireland;) your ad has convinced me! Ooo…video! Wonderful news! Love your take on stop action animation and how terrific your style looks as video (your images always seem alive even though they aren’t moving). You’re right: I was “…surprised, delighted, and amused…”and I can’t “…help feeling good about the brand.” I’d grab a bottle of Coca-Cola right now if I had any in the house! Another example in addition to that Canadian Tim Horton’s coffee commercial with Chinese-Canadians..
Hi, Jean! Many thanks for keeping me posted on Canadian cultural developments! Probably old news to Canadians, but brand-new to me, so thanks! I knew hockey was big in Canada, but after checking out those three links, I can see it’s a lot bigger than I thought– something that helps unite the country and functions as a common bond, regardless of people’s ethnic backgrounds. Baseball used to fill that role here in the States– the “national pastime,” at least when I was a kid– but football and basketball seem a lot more popular now. “Hockey Night in Canada Punjabi Edition”– that’s gonna keep me smiling for awhile. And I have a much clearer understanding of why hockey is such a good fit for content marketing in Canada– thanks for sharing! Good advice to any kid. Because of my concussion accident (I’m fine now. ), I don’t have much desire to watch football. Basketball is fun to watch.